Early 20th Century Thick Wood Frame from England. External measures cm 80 x cm 80 Inside cm 67 x cm 67 Refined frame from circa 1950s, made of gilded walnut. In the corners refined decorations. You can use this frame according to your imagination with a mirror, a beautiful painting or a large souvenir photo. Early 20th century French frame. Description Pink feathers. Silk ribbons. Glazed with acrylic. 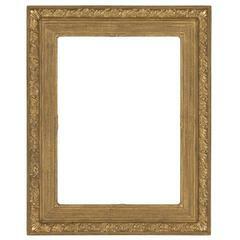 Molded giltwood frame. Materials silk, giltwood, feathers Dimensions Width 33.50" Depth 3" Height 33.50".